Join us in Boca Raton, Florida for the only conference in the United States dedicated to Caregiving Youth! We can't wait to meet you! The last conference of The Caregiving Youth Institute by The American Association of Caregiving Youth was held on April 27, 2017. We had hundreds of attendees. The complete Youth Institute Conference Program contains all the information about past content and speakers is located here. WPTV Palm Beach | Connie Siskowski and Isis Michalski talk about how youth caregivers can have an impact on households and discuss an upcoming conference April 27 in Boca Raton. 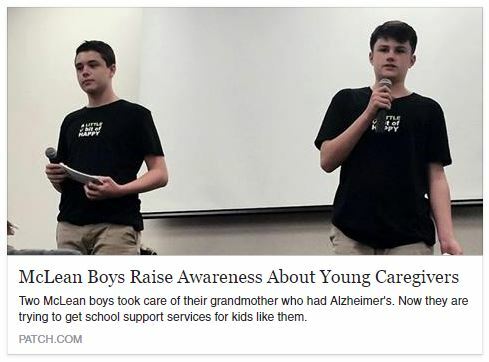 Patch Publications | McLean Boys Raise Awareness About Young Caregivers [ Charlie & A.J. Poole, Keynote Speakers from McLean, VA representing their family advocacy website kidsarecaregiverstoo.com - which documents one families journey with Alzheimer's caregiving and how it impacted their lives. If you are a caregiving family, academic or student interested in attending the CYI Conference 2019, please contact us. Scholarships are available under special circumstances.